I am excited to give notice that I have a new article out with the periodical Canadian Theological Review (2013). The title of the article is: “Beholding the Word of Christ: A Theological Reading of Colossians.” This is my contribution to the question about the theological substance or subject matter (Sache) of this important text. One thing I do in the essay is bring Colossians canonically into dialogue with Deuteronomy and the Gospel of John since there are some important shared themes (emphasis on Word, monotheism, divine presence). I also manage to sneak in a discussion of Bonhoeffer’s reading of Colossians and his approach to the theme of revelatory hearing vs. seeing.This article is not the definitive work on the theology of Colossians, but I hope it is a helpful contribution. The Justice Conference (Feb 21-22, 2014, LA) will feature a number of outstanding speakers including N.T. Wright, Bernice King, Rich Stearns, Jim Wallis, and my friend Bethany Hoang (and others). Its fun to know that this yearly event is growing and continuing to attract high quality speakers and artists. Sadly, I won’t be able to attend this year, but I hope it will fit better into my schedule and life in 2015! Today I had to sit at a car repair shop while my car was being checked out. I took along the new Zondervan Four Views on the Historical Adam (ed. Matthew Barrett and Ardel Caneday). You might say, “how can there be four views when the Bible says there was a real Adam, and that should do it?” Well, that really did do it in the pre-modern era, but the theory of evolution and recent study of genetics has put into doubt (in the mind of some readers of Scripture) the idea that the human race “began” only several thousand years ago, and that it happened with the formation of two beings at the start (Adam and Eve). Such concerns are expressed by the first contributor of this book, Denis Lamourex (Evolutionary Creation: No Historical Adam). More on him in a minute. Now, this book is sorely needed because the majority of American evangelicals presume Genesis 1-2 recount the origin of humanity historically and scientifically: thus, it is an issue of trusting Scripture over science, or at least doubting the scientific evidence behind certain theories of evolution and human origins. I am personally not in favor of Lamoureux’s view, though I am not against it either. In a 2011 Christianity Today article on this subject, it is reported that Tremper Longman III (one of my favorite American OT scholars) can see it both ways and is undecided on the issue because of its complexity. I am just about in the same place, so I can sympathize with Longman. The book continues after these views with “pastoral reflections” by Greg Boyd (who seems sympathetic to Lamoureux, but I haven’t read his essay) and Philip Ryken. Here, in this first reflection on the book, I want to mention a few things that stood out to me from Lamoureux’s chapter. Where is the grace and humility towards people like Lamoureux? Lamoureux expresses that he has a genuine Christian faith, he is “born again,” he doesn’t come into this discussion with liberal or pernicious motives, and he believes in a real Israel and a real Jesus who died and rose for our sins. In his essay he apologizes more than once if his perspectives caused anyone doubt or weakness in their faith. I find his humility honest and refreshing, and it pains me that he has been alienated and rejected (along with many, many other scholars) for his beliefs. (Let me restate, again, I do not necessarily agree with him.) I am sure he is hated by bloggers, belittled by many theologians, and demonized by the ignorant and unkind. Folks, he does not deserve that. He comes across as a man of true faith, a man who loves Jesus with all his heart. If he is wrong (and he may be), let’s not skewer him or exile him. If he needs a stern talking to, let’s leave that for St. Peter’s “briefing” at the pearly gates. Now, I am not saying that debate and discussion should not happen. I am just saying civility and humility used to be Christian virtues. Let’s pull those out of the closet again. Is it enough for us to be armchair scientists? The interesting thing about Lamoureux is that, as far as I know (please correct me), he is the only one among the contributors who has a doctorate in a field of science (specifically “Oral Biology – Dental Development and Evolution”; Univ of Alberta). While other contributors may be “well-informed,” there is a kind of level of experience and knowledge that is peculiar to advanced academic research at the doctoral level. That doesn’t make him “right” and the others “wrong,” but when theologians cast doubt and suspicion on “evolution” based on “personal research,” I am sometimes suspicious that some of those theologians don’t have enough academic training in the sciences to be able to write cogently and with due methodological circumspection. For example, we Biblical scholars get annoyed with bizarre and outlandish archaeological claims, but we do not expect everyday readers of the newspaper to be able to tell a good newspaper discussion on an archaeological find from a bad one. On the other hand, what if we have a Christian who is a scientist who doesn’t have good training in theology? That sometimes happens and it could be a problem, but Lamoureux is not such an example as he has a Master’s Degree from Regent College and a PhD in theology from Univ of Toronto (St. Michael’s College). He seems to have the education of someone we might want to listen to on just this kind of subject. Who decides whether Lamoureux is allowed to call himself an “evangelical”? This occurred to me when Lamoureux mentioned that his ideas are not liberal crazy-talk and that the fact that Zondervan (which he calls “the leading evangelical publisher”) included his perspective in the book points in the direction of allowing his “voice” to be heard from the inside of evangelicalism (he doesn’t say this exactly this way, but I think this is what he means; pg. 39). Also, he is a member of the Evangelical Theological Society (so his resume attests) and the Canadian Evangelical Theological Association (again, resume). And yet, I could see multitudes of Christians (and many pastors and theologians) say that his perspective on Adam puts into question his understanding of Scripture, which then calls into question his evangelicalism. So, who decides? Accommodation and Inerrancy? Time and time again, Lamoureux repeats that God could have revealed true scientific reality to the Israelites and the early Christians, but seems to have worked with their own (limited, flawed) scientific perspectives (e.g., flat immovable earth, rising sun) – thus, God “accommodated” to their own cultural viewpoints and used them (however incorrect scientifically) to teach spiritual truth. So, does that put into doubt a doctrine of the inerrancy of Scripture? Lamoureux doesn’t think so. In fact he uses both the language of inerrancy and infallibility regarding “truth” in Scripture, but he simply doesn’t think this carries to the extent that every statement regarding matters we think of as “science” in Scripture must be true (such as Paul’s appeal to three layers of the earth in Phil 2:9-11). This is where a lot of people get stuck and I think Alister McGrath’s words regarding Gen 1-2 and evolutionary creationism have stuck in my head: The issue is not the authority and reliability of Scripture, but rather the interpretation of Scripture. So, Lamoureux is as committed to the inspiration, authority, and complete trustworthiness of Scripture – equal to your Al Mohlers and John MacArthurs – but he simply adheres to a different perspective on the nature of Scripture (what is the nature of its revelation?, what counts as an error?, why is Scripture given? What is the nature of the human+holiness of Scripture?). Whether or not he is right on the historical Adam, I don’t think he suffers from an impoverished view of the authority and nature of Scripture. The Genre of Genesis. Does Genesis “do” history? Here Lamoureux tries to affirm that he thinks Genesis actually is interested in what we call “history,” but that really picks up in Genesis 12. Prior to that, the author(s) are much less interested in traditional history-telling. Is sin real? Lamoureux affirms that sin is real, the Bible makes a truth claim to its reality and its seriousness, and that Jesus came in real time and space to offer forgiveness. For him, the difference in his view is that sin did not literally enter through a historical Adam (or historical Eve for that matter). Is Paul wrong to make a link between historical Adam and historical Jesus? Here’s where it gets interesting. Lamoureux (along with others like Enns) thinks that Paul certainly did presume Adam was a historical figure, and if there was no Adam then Paul was wrong. But, Lamoureux adds, that does not jeopardize the truthfulness of Scripture because Paul’s point is still “true.” Lamoureux believes that the theological truth of Adam’s sinfulness and the redemptive-reparative work of the historical Jesus Christ, the “Last Adam” is valid. Now, this is where I have a much harder time. I think Lamoureux spent an insufficient amount of time and space on this matter in his essay, and this is unfortunate because this is, perhaps, the most controversial point. If there is no Adam, there is no “fall,” if there is no “fall” what do we do with the alien nature of sin (that God created a world perfect and without sin, and sin came through human disobedience)? If Adam did not introduce sin, who did? If no one, then where did it come from? Even if we can still establish a pan-anthropological doctrine of sin (based on common experience? ), this unhistorical Adam approach would make the “pre-fall” situation mythical, which then makes it harder to imagine a world without sin. We could imagine it, perhaps, but did it ever exist? It seems to me, this needs to be addressed as of primary or essential importance to make sense theologically of Lamoureux’s approach. If “evolution” is probable, something must be said about Adam. I think one of Lamoureux’s key points (unstated, but clearly presumed) is that, if evolution is likely (this is under debate in the book, but many scholars are moving in this direction, including some conservatives) we must say something about Adam. John Walton would be someone who takes a different approach than Lamoureux to Adam, though they both put stock in evolution (of the “theistic” kind). Are science and Scripture friends or enemies? Some scholars no doubt think that (1) Scripture is true in all areas including science, so the modern scientific theories which are “incompatible” are wrong [whether they will ever be proven to be by society or not], and thus (2) modern science can be an enemy of Scriptural truth. Others think they are friends – Lamouereux thinks that scientific discovery (even theories, like evolution) can aid us in better reading and understanding Scripture and exploring God’s truth. This is an area of serious contention. Some Christians are so committed to treating texts like Genesis as literal, scientific accounts, that they seem to be willing to do anything to discredit scientific theories. Certainly we cannot be blown by the wind of every scientific theory, but, again, evolution has been around a while (as a theory, I mean!) and there are few full-fledged, credible scientists who are Christians that aim to discredit this theory. Final Thoughts on Lamoureux’s essay. I think the merits of this essay involve his interesting perspective as both a scientist and theologian (not unlike my friend David Wilkinson). He articulates well (if with tedious repetition) how Scripture demonstrates non-modern scientific ideas (3-layer world, flat immobile earth). However, he has too little argumentative evidence for his view (specifically looking at Genesis or Genesis scholarship) and he spends almost no time engaging in the counter-arguments to his position. His essay, while enticing, cannot stand all by itself in favor of his view. I would propose it is an invitation to read more. And I will. The term “view” in “Five Views” is a bit misleading (which is also made explicit in the introduction), as these are not really views on the same level of discourse. You might think of them as “perspectives” or “thoughts.” When you are dealing with a doctrinal monster as big and complex as “inerrancy,” its tough to break it down into mutually exclusive views. One way that the the discussion is focused is the appeal to the Chicago Statement on Biblical Inerrancy (developed by conservative evangelicals in 1978). When it comes down to it, Mohler defends the CSBI without qualification. Bird and Vanhoozer accept it in spirit, but want to make sure the complexities of the nature of Scripture, hermeneutics, and Biblical interpretation are given appropriate highlighting. Franke and Enns are more critical and dismissive of the CSBI. The second controlling feature of the book is the agreement that each contributor talk through three case studies: The fall of Jericho in light of archaeological findings, the apparent discrepancy between Acts 9 and 22 (what the companions saw/heard), and the relationship between Deut 2o (kill the Canaanites) and Matt 5 (love your enemies). One thing you learn quickly from this discussion is that four of these guys are brilliant (I’ll leave it to you to decide which one is not) and if they can’t nail down exactly how we express the truthfulness and trustworthiness of Scripture, than we cannot blame people for getting confused. Much of the discussion revolves around the difference between “infallibility” and “inerrancy.” Bird feels very comfortable with “infallibility” because it can be defined in a way that approximates a healthy meaning of “inerrancy” and vice versa. Bird and Vanhoozer tend to put the focus on the primary teaching of the text, not a defense of all the little details. I think this is quite sensible, but I like that Enns pushes their line of reasoning: how far can you argue for literary license until it is no longer a true historical reporting/telling? Unfortunately, no one really answered Enns repeated concern (mostly because you weren’t allowed to respond to a response). Now, some may think this book is passe and the topic is dull. In some ways I agree, but I think the editors picked very good contributors to generate a thoughtful discussion and, as I tell my students, this question or issue of inerrancy is not going to go away. Even if it’s passe to you, someone in your church right now is wrestling with it. For me, while I think the book is “successful” insofar as it tackles the challenge of thinking about inerrancy, I wish they had done three more things. (2) Reflected on the difference between factual accidental mistake, accidental mistake based on limited knowledge, inconsequential mistake, and purposeful discrepancy. Not all “errors” are alike. A factual accidental mistake could be when Mark wrote that Abiathar was high priest in David’s time when 1 Sam 21:1-9 tells us it was Ahimelech (Mark 2:26; actually Nick Perrin argues it was not a mistake after all). An accidental mistake based on limited knowledge would be if an author made a mistake but couldn’t have known better (like referring to the four corners of the earth?). Inconsequential mistakes is when the facts really don’t matter so the author was not going for perfect accuracy (like rounded numbers). What about a purposeful discrepancy? Perhaps detailing the color of Jesus’ mock robe. Was it purple or red? The color-choice (and difference) seems intentional. I think this categorization is helpful because only a couple of these categories are really “errors” in any real sense, and it is those that we should be talking about. (3) Reflection on the humanness of Scripture. This comes out particularly in Enns and Franke, but what does it mean that Scripture is fully human, even if we also say it is “holy” or “inspired?” If Paul is a fallible human, does he go into a different “mode” when he is writing theologically? Particularly when writing the texts we have in the NT? Does his memory all of a sudden become perfect (not really acc to 1 Cor 1:14-15)? It seems like we first have to establish what we mean by “inspiration.” It would have made the book much longer (and more tedious) to do this, but perhaps a “five views” book is necessary on the subject of inspiration. What about me? Well, I am with John Stott that it is proper to say that Scripture is trustworthy because God is trustworthy. Stott, however, didn’t like some of the specific entailments of the language of inerrancy. It is enough to put one’s faith in Scripture as God’s Word and then to live out the truth it proclaims. In that sense, “infallibility” is not such a dirty word. Recently I reviewed the late R.T. France’s outstanding commentary on Luke in the new Teach the Text (TT) series from Baker. While the format and purpose of the series is well-conceived, I said that the quality of each book will ultimately be determined by the strengths of the author. In the case of Luke, France was the perfect choice. 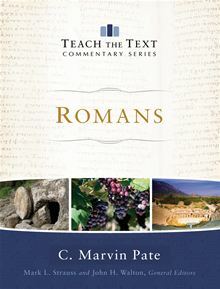 The first TT volume in New Testament is the one on Romans by C. Marvin Pate. I will not give his commentary detailed treatment (esp since it follows the format of France’s and you can read my thoughts already on that), but I think it represents the aims of the series adequately and offers much help especially in the teaching and preaching advice. Here are a few points of interest, praise, and concern. Eschatology. Pate draws out the eschatological dimensions of the Christ event and reads Romans in light of salvation history. What he does, he does exceptionally well. Covenantal/Deuteronomic reading. Pate tries to argue that Romans follows a covenantal-treaty outline that mimics the outline of Deuteronomy. He does not overplay this annoyingly, but I was not convinced by it. Obviously people like Wright use “covenantal” language for Paul’s theology more broadly, but Pate (I think) takes it too far into specifics. Women. Pate does a good job reflecting on the significance of women in Paul’s final greetings. C.S. Lewis. Lots of Lewis quotes and illustrations in his commentary. Old Perspective/Lutheran. Overall, Pate does not make Old/New Perspective issues a big deal in the text itself, but if you follow the end-notes you will quickly see his preference for Doug Moo’s approach to Romans (and Paul) and his overall disagreement with Dunn. This is fine (he has a right to his own opinion), but I don’t think he makes clear the varieties of New Perspective approaches (Dunn vs. Sanders vs. Wright, etc…) and he tends to interact with Dunn’s older works rather than his newer ones (esp The New Perspective on Paul where Dunn clarifies a number of important matters). Calminians? Pate tries to find a via media between Calvinistic readings and Arminian readings of election language in Rom 9-11. Thus, “God sovereignly chooses individuals’ destinies, but paradoxically humans have the power and responsibility to choose Christ for themselves” (194). As much as I normally like a good compromise, I just can’t accept this both-and approach. It just doesn’t seem to work. Illustrations and Theological Pointers. These, much like we found with France, are outstanding. Once in a while I didn’t think the illustration was relevant, but the vast majority of his tips are golden. I would not hesitate to direct students to this section when preaching on Romans. Nation, I am not going to lie to you – I love me some good missional theology. While scholars who are missionally-minded come from various disciplinary sectors (cultural theology, missiology, biblical studies, ecclesiology, historical theology), they often read each other’s work. Nevertheless, usually we feel “at home” especially in our own discipline. 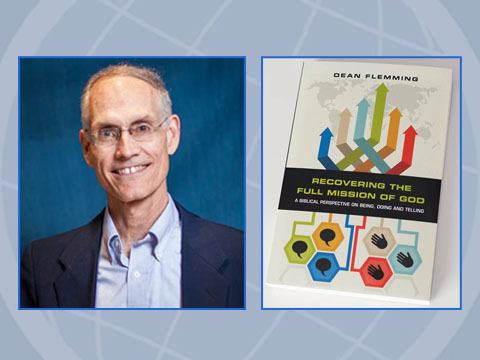 Thus, I was pleased to see Dean Flemming (New Testament scholar) write a book called Recovering the Full Mission of God: A Biblical Perspective on Being, Doing, and Telling (IVP, 2013). As you might imagine from the title, Flemming walks the reader through the Bible from beginning to end, showing the robust, multi-dimensional nature of the Gospel that is meant to bring good news to all of life. The power and grace of God are displayed not only in words, but also in action. Furthermore, it is put on display in the “being” of the people of God – who they are as transformed people, servants and apostles of Jesus Christ. This is not the only book of its kind out there. I noticed that Flemming draws often and deeply from the work of Christopher Wright. However, Wright is an Old Testament scholar and his work excels especially in that testament. Flemming offers special insight into the New Testament perspective, and Flemming has previously published works in this area on Philippians and Revelation (if memory serves me correctly). Flemming’s work is also insightful given his own experiences. He talks about growing up in an environment where he was taught that “sharing Jesus” was primarily a verbal phenomenon (like sharing an evangelistic Bible tract). However, later in life he became a Bible teacher in the Philippines. In another context, as an educator in Western Europe, Flemming found that verbal evangelism was inadequate in such a post-Christian context. Flemming, throughout the book, makes it clear that words matter, and verbal proclamation is fundamentally important, but he noticed in Europe “More often people are initially attracted by lives that have been genuinely transformed by the love of Christ. The text they read in our lives and loving relationships can nurture an openness to hear why we live and love the way we do” (13). Flemming admires this lifestyle witness, but feels that many Europeans are not doing enough with their words. You can see the problem here between words and works in regards to the mission of God. Flemming’s work is timely. It almost seems like a response to Kevin DeYoung and Greg Gilbert’s What is the Mission of the Church? where these co-authors critique the social-centered approach of missional theology. (See discussion here.) But Flemming does not actually mention that book. Instead, at the end of Flemming’s work, he interacts with and tries to push against Duane Litfin’s 2012 book Word Versus Deed: Resetting the Scales to a Biblical Balance where Litfin argues that “evangelism” should be narrowly defined in verbal terms. Here is Flemming’s assessment. Flemming has the right academic training, personal experiences, and literary skill to compose an engaging argument against the narrow perspective supported by those who critique missional theology. Just one more thought – is there something to the idea that Flemming and Chris Wright have spent significant time travelling outside of the West? I think so. Bottom line – this is a book worth reading. Here. Great to see Jan Lambrecht in this issue, but does he know that Wright did not actually write Romans 4? Shaw’s article looks very interesting as well! ‘The Rock Was Christ’: The Fluidity of Christ’s Body in 1 Corinthians 10.